"Berobed, bewigged, and a little bit bewildered", renowned broadcaster Peter McHugh writes for Channel 4 News about the pomp and ceremony surrounding the Queen’s Speech. 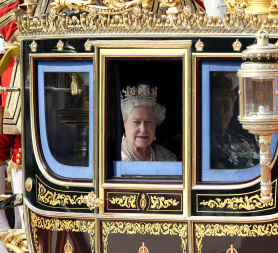 It was when the Imperial State Crown arrived in its own coach that you realised it was a special day. It had travelled to the Houses of Parliament with something that looked like a red tea-cosy on a stick, so it must have been the state opening. Yesterday, the Queen and Prince Phillip had opened the Chelsea Flower Show, all blooms and bouquets - yellow and blues. Alan Titchmarsh was in attendance to give it that extra royal seal of approval. Not to be outdone the BBC produced one of its own gems Huw Edwards (David Dimbleby must have been double-booked) to host this slightly older event. Huw, whose Welsh accent adds to his lugubriousness, was naturally at home with the pomp and circumstance. The event, obviously adapted from a Gilbert and Sullivan script, had all our best loved characters. More Lord Highs than you could count; the members of the Yeoman of the Guard, founded in 1485, not many years earlier it seemed than some of those on parade. Assorted rods and sticks, and gold braid by the metric tonne. Among the crowd pullers was the democratically titled Lord Great Chamberlain, whose proper name is the Marquess of Cholmondeley (pronounced Cholmondeley). He had a natty white billiard cue and a nice pair of tights. Not quite the model of a modern major general. Meanwhile the real business if the day got underway. To that well known cry "hats off, strangers" the Ronnie Corbett of the Commons, Speaker John Bercow, popped into the chamber to lead his lot to the Lords to find out what they would be doing for the next 18 months. Black Rod had taken a sickie so another bald bloke, again with a stick, banged on the door of the Commons' chamber with the Queen's message "come out, we know you're in there". It was then that we discovered a great secret. The first that Nick Clegg, in what the Daily Mail will consider lese majeste, had refused to slip into his his buckled brogues as Lord President of the Council and attend the Queen. Instead, Nick had opted to attend his new partner Dave, who by the way is still living at home, not with his mam we think, but even so! There was a sticky moment on the way to the Lords when Harriet Harman muscled past him to accompany the prime minister but all came right once they got there and Nick slipped into his rightful place by his partner's side. A word of advice to the prime ministerial team; either more time on the sunbed for Nick, or a little bit less for Dave. The Queen and Duke had arrived earlier. She was wearing her everyday crown, but swapped it for her Sunday best for the main event. The Duke wearing more decorations than half the audience put together, accompanied her through the crowd looking as if he wanted to check their tickets. And then they were there. Two gold thrones, the one for the Queen, one inch higher than that for the Duke, intoned Huw who surely must have checked his own seat. And then suddenly, the Grand Poohbah himself. The right honorable member for Rushcliffe, the Secretary of State for Justice, The Lord Chancellor, Kenneth Harry Clarke. Berobed, bewigged, and a little bit bewildered, Ken was carrying the Queen's Speech in what looked like a fair trade, environment-friendly, hand-woven carrier bag. He was supposed to back down the steps but Ken did not get where he is today by being a complete fool. Just like his party he turned around and walked the other way. Her Majesty, with the air if a cynic who has done this gig 57 times before, told us what her government planned to do. Several ministers looked somewhat surprised. The Lords looked on. You spotted faces you thought had gone to their maker, or to prison, years ago. You spotted Lady Thatcher, a reminder of nightmares past, and then Dave and Nick, a reminder of nightmares yet to come. The emergency budget is on 22 June. The Queen and the Duke are going to Canada straight after. Perhaps they have seen it all before.